Ordering was super easy, and shipping was surprisingly fast! (to Canada). 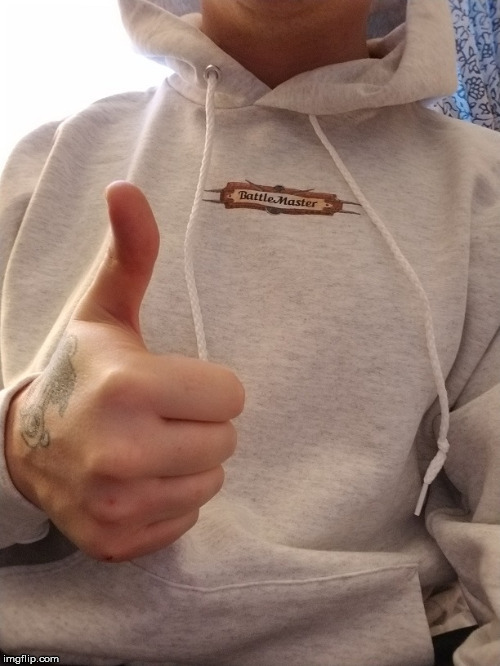 I got the package and pulled out a terribly cozy sweater, ready to rep my favorite game. I slid it over my head and the first thing I felt was the sensation of heavenly clouds caressing my skin. The inside is so soft, it makes baby lambs feel like steel wool. Not only is it raising awareness for BattleMaster, it is also a total babe magnet! My wife hasn't been able to keep her hands off of me ever since I started wearing it! She won't let me wear it outside the house because I will undoubtedly be mauled by a mob of women overcome with desire. An excellent hoodie with a dope AF logo on the chest. Thumbs up! You need to recruit her for the Dominion.